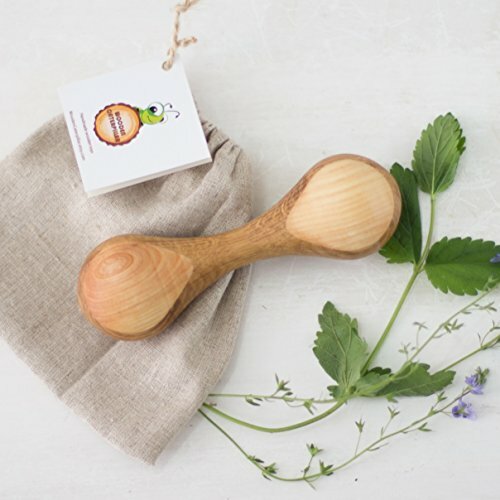 This beautiful wooden rattle will become a real treat for your baby. This toy keeps the warmth of 2 wood species - oak and ashwood. It is super smooth and is extremely tough and never splinter. So, even if your baby decides to use it as a teether, there won't be any splinters or damage to the toy. The rattle makes a pleasant hissing sound, drawing your baby's attention and helping to develop his or her listening skills. It is easy to grasp for babies over 5-6 months, helping develop the minute movements of your child's wrist. Perfect size and shape for little hands. Color: We use 2 contrasting species of wood to make the rattle more beautiful. This one is made from natural brown oak (base) & light ashwood (insertions). If you have any questions about this product by Wooden Caterpillar Toys, contact us by completing and submitting the form below. If you are looking for a specif part number, please include it with your message.